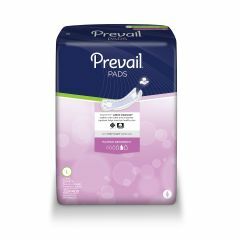 Prevail Bladder Pads are body-shaped pad inserts with a cloth-like outer Fabric that are designed for stress and urge incontinence. Featuring the Target Acquisition Zone and the Blue Stay-Dry Strip, liquid is quickly wicked and locked away from the skin for ultimate skin dryness, leakage protection and odor control. With a full-length adhesive strip for secure anchoring, Prevail Bladder Control Pads offers the ultimate in discretion and protection. Advanced Zoning System: AZS AZS improves product performance through specialized functional zones. Breathable Zone: Prevail Bladder Control Pads do not fully surround the body allowing air to feely migrate to the wearer. I love this product. It works very well. I know I will not have embarrassing leeks,&amp; odors. This products gives me confidants to continue to be active. The on line sight is easy to navigate and I receive fast delivery and the customer service is top notch. Great absorbency. Great length. Unfortunately the sticky strip does not run the entire length of the pad. Still a good product. Wow a lot of coverage. Wish this item wasn't so long, fills like a boat. Do like that there are no leaks on the sides. What is the width of the 11" and the 13" pads??? will u ever stock 16"prevail pads? they are excellent. Asked on Feb 20, 2013 8:19:00 AM by mimi from ct.